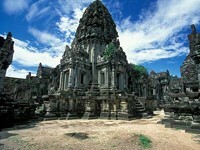 This is our basic tour including the most important temples in Angkor and the Tonle Sap Lake. 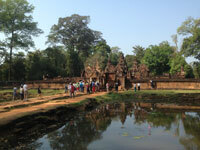 In addition to "Angkor Highlights", you also visit the famous Banteay Srei temple and the River of Thousand Lingams. Pick up from your arrival point in Siem Reap ( Bus - / Boat station / airport ), transfer and check in Ta Som Guesthouse. Welcome drink and cold towel upon check in. In your room, we provide a tropical fruit basket upon arrival.mEnjoy your Remork (Tuk Tuk) transportation with English speaking driver and with our experienced English speaking tour guide to the nearby (15 minutes drive) Angkor Archaeological Park,UNESCO-World Heritage site since 1992. Visit of Angkor Thom: Entering this once largest city of the world form the South Gate, you admire the street of 108 gods and devils. Easy walking tour to Baphuon Temple and Phimenakas Temple. 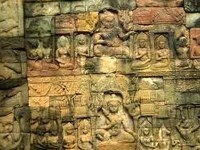 We walk further to the Terrace of Elephants and Terrace of Yama (the so called leper king) and see the fantastic reliefs. Great round view. Take your best photos! Study the fantastic base reliefs of Angkor Wat, depicting scenes of Hindu mythology (like the churning of the milk sea) and climb up to the third level of this holy place, where once only the Angkorian priests and kings have worshiped their gods. Enjoy the great round view and take your time for meditation on a quiet place. Sunset from Phnom Bakheng (very busy but famous for sunset), a lovely and quiet place to reflect your discoveries in Angkor. Transfer back to Ta Som Guesthouse for optional dinner in our Ta Som Garden Restaurant. Try the famous traditional Amok Fish, delicious and not spicy! In the evening, optional Apsara Dance show, only 200 metres from your guest house! Overnight in Ta Som Guesthouse in air conditioned room. Day 2: Sunrise in Angkor Wat - Srah Srang - Walking tour through "jungle temples" Banteay Kdei and Ta Prohm - Preah Khan - Neak Pean - Eastern Mebon. Transfer with your Remork (Tuk Tuk) driver to Angkor Wat (no tour guide for sunrise!). After sunrise, you meet your tour guide and have at first breakfast (as breakfast box) on the picturesque Srah Srang Water Basin. Enjoy this quite place, the former royal bath. 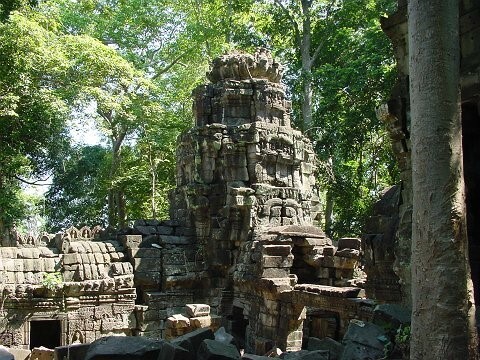 Start for a walking tour through Banteay Kdei and Ta Prohm, the so called "jungle temples". This tour is easy and takes us about two hours. Enjoy to "feel" and to "smell" Angkor! TheEFEO (Ecole Francaise d'Extrême-Orient) has decided to keep this temple overgrown by the jungle. Enjoy the trees growing out from the temple ruins and feel like the first explorers and "discoverers" of Angkor,like Henri Mouhot or Lunet de Lajonquière. Time for lunch in front of the gigantic Western face gopura (Western temple entrance) of Ta Prohm in a local restaurant (not included). In the afternoon, we explore Preah Khan temple (with huge trees overgrowing the ruins). The temple complex has been ideally restored by the World Monument Fund. 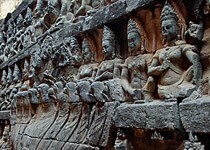 Learn about the enormous looting problem in Angkor and the important savegarding and preservation activities of the WMF. Go on seeing the most important tempels on the "grand circuit", like Neak Pean (holy bath) and the Eastern Mebon (with Elephant statues). As Ta Som Temple gave the name to our Guesthouse and Tour Agency, the visit of this marvellous small temple is also included in this tour! Ta Som means "the ancestor", king Jayavarman VII dedicated this temple to his teacher. Enjoy the famous eastern gopura of Ta Som, which is depicted on our logo. Take your picture! Sunset from Pre Rup or from another place (according to day 1). Transfer back to Ta Som Guesthouse, optional dinner. On this second day, you should try the traditional beef Loklak, together with a refreshing and vitalizing pineapple juice! After your second day in the temples, you might be tired and need a good massage? We can organize traditional Khmer massage (from US$ 6 per hour, optional!). After your breakfast in Ta Som Guesthouse, enjoy an excursion in air conditioned car in the Northern part of the Angkor Archaeological Park. On your way, you pass through picturesque landscapes with rice fields and sugar palms to another highlight of Angkor: the famous and precious Banteay Srei Temple. After having studied the different reliefs depicting scenes of Hindu mythology, we go on northwards to a holy place where in Angkorian times, thousands of Lingas (the phallus symbol of the Lord Shiva) have been carved into the riverbed, in order to fertilize the water going down to the Angkorian plain. This place is called Kbal Spean or the River of Thousand Lingas. Easy Walking tour (about one hour) through tropical dry forest and see the different places of carvings in the riverbed. Your experienced English speaking tour guide explains you the meaning of the interesting carvings. Time for lunch in a local restaurant in Kobal Spean (not included). On your way back to Siem Reap, you also visit Banteay Samre Temple. In the evening, enjoy a classical Apsara dance show. Breakfast in Ta Som Guesthouse. Transfer by air conditioned car to Tonle Sap Lake. Enjoy a boat trip (about two hours) on the Tonle Sap Lake, the greatest fresh water reservoir with the highest biodiversity in the world. 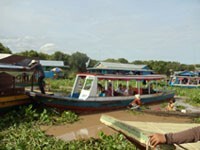 See the floating village of Chong Kneas - rice cultivation, fishing farm - crocodile farm and life with and on the water. After the tour, return to Ta Som Guesthouse. End of package tour "Angkor Discovery". Three nights in Ta Som Guesthouse in air-conditioned room with private ensuite bathroom, cold/hot water, minibar, Sat TV. 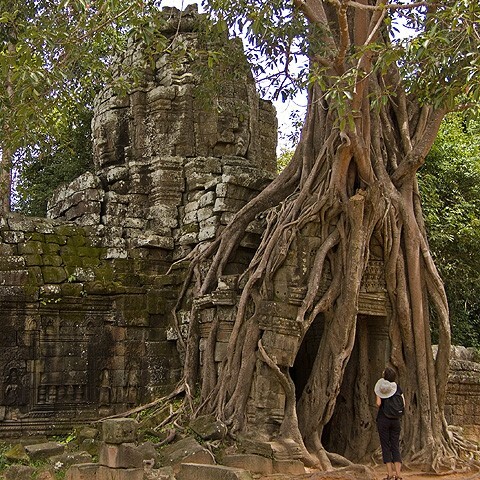 • Walking tour through "jungle temples" Banteay Kdei and Ta Prohm (about two hours). • Personal expenses and others not stated above. • The entrance fee for Angkor Archaeological Park (ticket). • The price is in US-Dollar per person. • The price for 2 persons is based on accommodation in one double room or one twin room. • The price for 3 persons is based on accommodation in triple room. • The price for 4 persons is based on accommodation in two double rooms or two twin rooms. 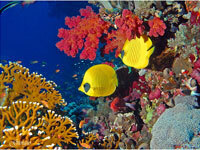 We arrange this tour for one person and also more than 5 persons in the reasonable price. 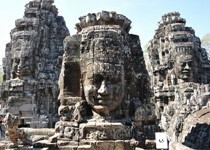 Destination: Including all Angkor Temple Highlights!. Angkor Wat, Angkor Thom, Bayon, Ta Prohm.Sunset from Phnom Bakheng. Boattrip to Floating Village on Tonle Sap Lake. Including Countryside Tour!. Visit of traditional, Silkfarm . This tour program starts in the afternoon. This allows you to drive on this day by bus from Bangkok or Pattaya to Siem Reap (excluded). Arrive in Siem Reap in the afternoon, pick up from bus station. Check-in Ta Som Guesthouse with welcome drink and cold towels. In your room, we provide a tropical fruit basket. Transfer by air conditioned car to Phnom Krom on the shores of the Tonle Sap Lake. Boat trip: Enjoy a boat trip (about two hours) on the Tonle Sap Lake, greatest fresh water reservoir in Southeastasia with the highest biodiversity in the world. Floating village: See the floating village Chong Kneas and visit a fish farm and a crocodile farm. Learn about rice cultivation, fishing techniques and life with and on the water. Traditional Khmer massage: Return to Ta Som Guesthouse. After this long day, relax and revitalize your body with a traditional Khmer massage in your room. Win new energy for the next day in Angkor! Day 2: Angkor Thom - Bayon - Ta Prohm - Angkor Wat - sunset Phnom Bakheng. Breakfast in Ta Som Garden Restaurant. 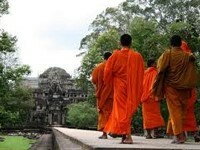 With your experienced and licensed tourguide, discover nearby UNESCO World Heritage Site Angkor. 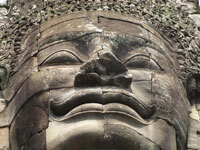 Visit at first the South Gate of Angkor Thom and the Bayon Temple with its enigmatic face towers. Go on your visit on the small circuit and pass by the Royal Terraces, Thommanon, Chau Say Thevoda, Ta Keo to reach Ta Prohm, the so called "jungle temple". 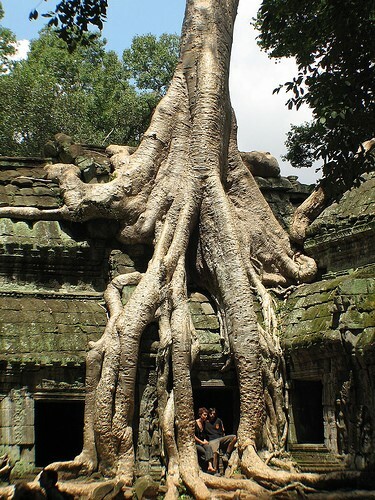 Enjoy the special atmosphere in Ta Prohm and take your pictures of the huge trees growing on the temple ruins. 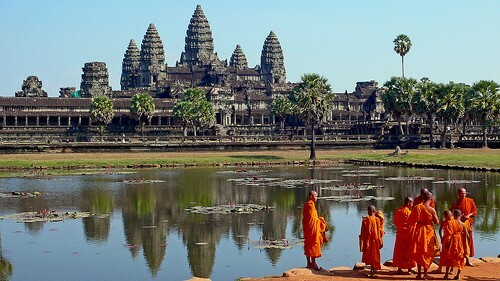 visit world famous Angkor Wat, the largest temple area in the world. Study the fantastic bas-reliefs and climb on the temple's third level with its stunning roundview. 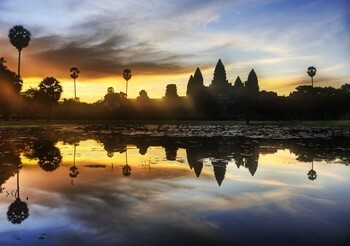 For sunset, climb on Phnom Bakheng, to see Angkor Wat lying in the jungle. In the evening, enjoy the Traditional Apsara Dance Show & a delicious Dinner Buffet. After breakfast, visit the beautiful Angkorian Coutryside, where life seems to have stood still since the ancient Khmer Empire. See traditional rural life with stilt villages, rice paddies, sugar palms and water buffaloes. The silkfarm of Siem Reap is famous for its traditional high quality products. Learn about the whole process starting from the mulberry plants, the silk worms and ending in amazing, colourful silk products. You have enough time to return by car/bus via Poipet to Bangkok or Pattaya in the same day (excluded). Очень приятно было общаться с г-ном Мэнгом, как по электронке, на стадии бронирования (отвечает сразу и подробно), так и лично. Очень приятный, опрятный гестхауз, действительно, домик для гостей с очень радушным персоналом, хорошей кухней и очень приятными ценами за все. Обычно мы, путешествуя, никогда не используем "пакетные" туры, но здесь сделали исключение и очень рады этому. Во-первых это похоже больше на обслуживание VIP персон, чем тур для туристов-пакетников. Последние полгода мы все время в дороге, и посетили на своем пути много гестхаузов, и Ta Som достойно занял первое место в нашем рейтинге. Пять баллов! Более подробно о наших путешествиях можете прочитать здесь: http://alec220.livejournal.com Your Name: Киселев Алексей Posted Date: 03/06/2011. Two nights in Ta Som Guesthouse in air conditioned room with private ensuite bathroom with cold/hot water, minibar, Sat TV. • Pick up from airport / bus- / boat station and transfer to Ta Som Guesthouse. • Welcome drink and cold towel upon check-in in Ta Som Guesthouse. • Tropical fruit basket in room upon arrival. • Mineral water (1 bottle per person per day). • Transportation by air-conditioned car to Tonle Sap Lake on day 1. • Boattrip on Tonle Sap Lake to visit Chong Kneas Floating Village (about 2 hours). • Traditional Khmer Massage in room (about one hour). • Transportation by REMORQUE for full day (eight hours) on first day along "small circuit". • Experienced English speaking, licensed local tourguide for full day visit of Angkor Archaeological Park(eight hours) on second day, including visits of Angkor Thom, Bayon, Ta Prohm, Angkor Wat and Phnom Bakheng. • Experienced English speaking, licensed local tourguide on third day. • Experienced English speaking driver. • Walking tour inside Angkor Thom (about one hour). • Walking tour through "jungle temple" Ta Prohm (about one hour). • Traditional Apsara Dance Show & Dinner Buffet. • Half day countryside tour. • Visit of traditional Silkfarm. • Accommodation for two nights in Ta Som Guesthouse in air conditioned room with private ensuite bathroom with cold/hot water, minibar, Sat TV. • Breakfast on day 2 and day 3. • Transfer to airport / bus- / boat station. • Personal Expenses, Food and Beverage others than stated above. • The price for two persons is based on accommodation in one double room or one twin room. • The tour itinerary may be subject to changes for climatical or other reasons. • Read full Terms & Conditions. Pick up from your arrival point in Siem Reap (airport / boat station / bus station) and transfer to Ta Som Guesthouse. Check in with welcome drink and cold towels. We provide a tropical fruit basket in your room upon arrival. Drive with our experienced English speaking guide to the Roluos Temple group, located in the Southeast of Angkor. 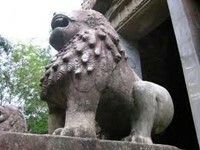 Visit Lolei, Preah Koh and Bakong Temple. 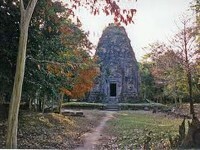 In Roluos, the first temple mountain of the Angkorian plain was built, the Bankong. Study the principles of Khmer architecture whose evolution you will later see in the other places of this intensive tour. Driver to Angkor Archaeological Park and visit Angkor Thom. Study Bayon Temple, with its famous face tours (the "smile" of Angkor) and bas reliefs from the 14th century, depicting the daily life that doesn't seem to have much changed until now. Optional: You can start your visit by riding a balloon (staying on the same place, around 15 minutes!). Great roundview. Take your best fotos! Enjoy the great roundview and take your time for meditation on a quiet place. Sunset from Phnom Bakheng (very busy but famous for sunset) or Preh Rup, a lovely and quiet place to reflect your discoveries in Angkor. Transfer back to Ta Som Guesthouse for optional dinner in our Ta Som Garden Restaurant. Try the famous traditional Amok Fish, delicious and not spicy! In the evening, opitional Apsara Dance, only 200 metres from your guest house! 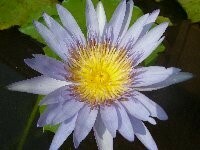 Day 2: Sunrise in Angkor Wat - Srah Srang - Walking tour through "jungle temples" - Preah Khan - Neak Pean - Eastern Mebon. Your English speaking tourguide will explain the meaning of the sun in relation to the tempels' architecture. What means the "temple code" of Angkor Wat? After having discussed these questions, you have breakfast ( as breakfast box) on the pittoresque Srah Srang Water Basin. Enjoy this quite place, the former royal bath. 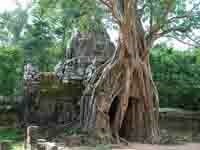 Start for a walking tour through Banteay Kdei and Ta Prohm, the so called jungle temple. This tour is easy and takes us about two hours. (In our opinion as tour agency, walking is a much more intensive way to "feel" and to "smell" Angkor than sitting only in a car and getting off at some spots. In the afternoon, we explore Preah Khan temple (with hugh trees overgrowing the ruins). The temple complex has been ideally restored by the World Monument Fund. 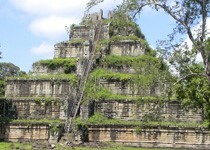 Learn about the enormous looting problem in Angkor and the important savegarding and preservation activities of the WMF. Go on seeing the most important spots on the "grand circuit", like Neak Pean (holy bath) and the Eastern Mebon (with Elephant statues). Our special: As Ta Som Temple gave the name to our Guesthouse and Tour Agency, the visit of this marvellous small temple is also included in this tour! Ta Som means "the ancestor", king Jayavarman VII dedicated this temple to his teacher. Enjoy the famous eastern gopuram of Ta Som, which is depicted on our logo. Take your picture! Transfer back to Ta Som Guesthouse, optional dinner. On this second day, you should try the traditional beef loklak, together with a refreshing and vitalizing pineapple juice! After your second day in the temples, you might be tired and need a good massage? We can organize traditional khmer massage by blind for just US$ 6 per hour (optional!). Overnight in Ta Som Guesthouse. 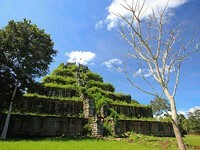 After your breakfast in Ta Som Guesthouse, enjoy an excursion in the Northern part of the Angkor Archaeological Park. On your way, you pass through picturesque landscapes with ricefields and sugar palms to another highlight of Angkor: the famous and precious Banteay Srei Temple. 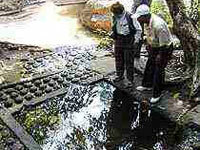 After having studied the different reliefs depicting scenes of Hindu mythology, we go on northwards to a holy place, where in Angkorian times, thousands of Lingas (the phallus symbol of the Lord Shiva) have been carved into the riverbed, in order to fertilize the water going down to the Angkorian plain. This place is called Kobal Spean or the River of Thousand Lingas. Easy Walking tour (about one hour) through tropical dry forest and see the different places of carvings in the riverbed. Your experienced English speaking tourguide explains you the meaning of the interesting carvings. Driving back to Siem Reap, you also visit Banteay Sam Re Temple. Breakfast in Ta Som Guesthouse. Transfer to Phnom Krom on the shores of the Tonle Sap Lake. Enjoy a boat trip (about two hours) on the Tonle Sap Lake, the greatest fresh water reservoir with the highest biodiversity in the world. 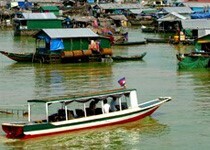 See the floating village of Chong Kneas. Learn about rice cultivation, fishing techniques and life with and on the water. Feel like the first explorers of Angkor, when you stroll over ruins and through deep tropical vegetation in Koh Ker and Beng Mea Lea. After early breakfast in Ta Som Guesthouse, start northeastwards, after 1 ½ hours, arrive in Koh Ker. Visit at first the 35 metres high temple mountain, called Prasat Thom. Breathtaking views from the summit. Drive around by your car to remote temple areas with gopura and nice carvings and lintels. See the holy lingas in the cellas. Visit the stone carries, where the sandstone, used for building most Angkor temples, was broken. You will have picnic lunch on a lovely place on the baray (water basin) in Beng Mea Lea. Feel like the first explorers when you search your way over broken ruins and temple walls. 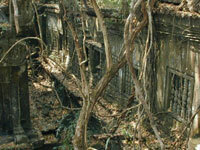 The large temple area is still overgrown by the tropical dry forest. Beng Mea Lea temple is on the old Angkorian roads leading from Angkor to the Great temple of Preah Khan of Kompong Svay. You will see some of the old stone bridges. To complete your Angkor experience, we highly recommend the "Bird Sanctuary Prek Toal", where you will feel like in a Hitchcock's movie and our "Countryside tour" where you go deeper into the way of living of the locals (rice fields, sugar palms, water buffaloes). This life doesn't seem to have much changed since Angkorian times. 4 overnights in Ta Som Guesthouse in air conditioned room, private ensuite bathroom with cold/hot water, minibar, Sat TV. • Transportation by REMORK (Tuk Tuk) for full day (eight hours) on first day to Roluos Group and along "small circuit", along "grand circuit" on second day. • Transportation by air conditioned car to Banteay Srey and Kobal Spean on third day, to Tonle Sap Lake on fourth day, to Koh Ker and Beng Mealea (on fifth day, eight hours). • Experienced English speaking, licensed tour guide on first, second, third and fourth day (eight hours), according to tour program. • Accommodation for four nights in Ta Som Guesthouse, in air conditioned room with private ensuite bathroom with cold/hot water, minibar, Sat TV. • Lunch box on day 5 (picnic in Beng Mealea). Please note: As you might wish to add more visits of Angkor Archaeological Park, the entrance fee for Angkor (ticket) is not included. Destination: Small and big circuit, from sunrise to sunset. Angkor Free & Easy is the perfect package for individual travelers who prefer a prebooked arrangement with transfers and accomodation, but like to be independent. On one day, a Remorque with driver(Khmer Motorbiketaxi / Tuk Tuk) is at your disposal to drive around Angkor Wat, the small and big circuit, from sunrise to sunset.The other days of your stay are at leisure. Two nights accomodation in Ta Som Guesthouse in airconditioned rooms with private ensuite bathroom with cold/hot water, minibar, Sat TV. • Pick up from airport / bus station / ferry dock. • Tropical fruit basket in your room upon arrival. • Mineral water in your room (one bottle per person per day). • Overnights in air conditioned rooms. • One full day Remorque (Khmer motorbike taxi) at your disposal, for driving around Angkor Wat and other temples inside Angkor Archaeological Park on the small and big circuit. From sunrise to sunset. • Transfer to your departure point (airport / bus station / ferry dock). • Meals and drinks other than stated above. • Personal expenses and other than stated above. • The entrance fee to Angkor Archaeological Park is excluded. This allows you design your stay in Angkor according to your own wishes. Pick up from your arrival point in Siem Reap ( Bus - / Boat station / airport ), transfer and check in Ta Som Guesthouse. Welcome drink and cold towel upon check in. In your room, we provide a tropical fruit basket upon arrival. Transfer with our experienced English speaking local tour guide to the nearby Angkor Archaeological Park, UNESCO-World Heritage site since 1992. Entering Angkor Thom, this once largest city of the world form the South Gate, you admire the street of 108 gods and devils. We walk further to the Terrace of Elephants and Terrace of leper king (the so called leper king) and see the fantastic reliefs. Time for optional lunch in a local restaurant with good view to the historical central place of Angkor Thom. You should try the good noodle soup! Optional: You can start your visit by riding a balloon (staying on the same place, around 15 minutes!). Great round view. Take your best photos! Study the fantastic base reliefs of Angkor Wat, depicting scenes of Hindu mythology (like the churning of the milk sea) and climb up to the third level of this holy place, where once only the Angkorian priests and kings have worshiped their gods. Enjoy the great round view and take your time for meditation on a quiet place. Transfer back to Ta Som Guesthouse for optional dinner in our Ta Som Garden Restaurant. Try the famous traditional Amok Fish, delicious and not spicy! 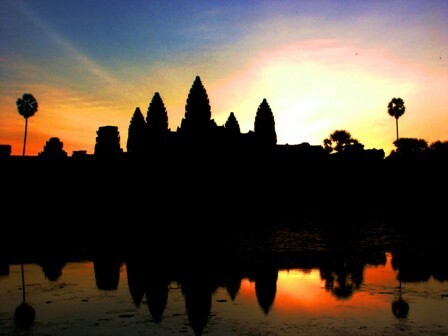 Transfer from Ta Som Guesthouse to Angkor Wat with your driver (without tour guide for sunrise!). After sunrise, you meet your tour guide and have at first breakfast (as breakfast box) on the picturesque Srah. Srang Water Basin. Enjoy this quite place, the former royal bath. This tour has a special itinerary and is easy. It takes us about two hours. 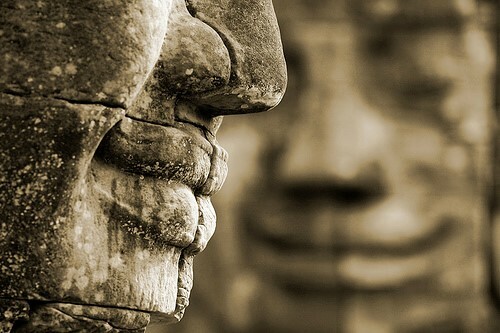 Enjoy to "feel" and to "smell" Angkor! (If you want, the walking tour can be shortened up to one hour, according to your condition). The EFEO (Ecole Francaise d'Extrême-Orient) has decided to keep this temple overgrown by the jungle. Enjoy the trees growing out from the temple ruins and feel like the first explorers and "discoverers" of Angkor, like Henri Mouhot or Lunet de Lajonquière. In the afternoon, we explore Preah Khan temple (with huge trees overgrowing the ruins). The temple complex has been ideally restored by the World Monument Fund. 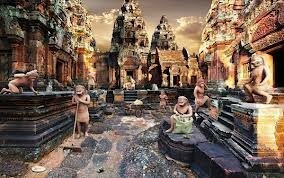 Learn about the enormous looting problem in Angkor and the important savegarding and preservation activities of the WMF. Go on seeing the most important temples on the "grand circuit", like Neak Pean (holy bath) and the Eastern Mebon (with Elephant statues). Our special: As Ta Som Temple gave the name to our Guesthouse and Tour Agency, the visit of this marvelous small temple is also included in this tour! Ta Som means "the ancestor", king Jayavarman VII dedicated this temple to his father. Enjoy the famous eastern gopura of Ta Som, which is depicted on our logo. Take your picture! After your second day in the temples, you might wish to enjoy a traditional Khmer massage (from US$ 6 per hour, optional!). Optional dinner in Ta Som Garden Restaurant. You should try the famous Loklak beef. Enjoy a boat trip on the Tonle Sap Lake (about two hours), the greatest fresh water reservoir with the highest biodiversity in the world. See the floating village of Chong Kneas. Visit the fish farm and the crocodile farm. Learn about fishing techniques and life on the water. 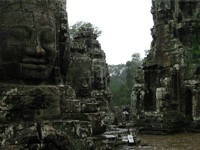 End of package tour "Angkor Highlights". To complete your Angkor experience, we highly recommend the "Bird Santuary Prek Toal", where you will feel like in a Hitchcock's movie and our "Countryside tour" where you go deeper into the way of living of the locals (rice fields, sugar palms, water buffaloes, ox cart drive). This life doesn't seem to have much changed since Angkorian times. Two nights accommodation in Ta Som Guesthouse in air-conditioned rooms with private ensuite bathroom with cold/hot water, minibar, Sat TV. •Pick up from airport / bus- / boat station and transfer to Ta Som Guesthouse. •Welcome drink and cold towel upon check-in in Ta Som Guesthouse. •Tropical fruit basket in room upon arrival. •Mineral water (1 bottle per person per day). •Transportation by REMORK for full day (eight hours) on first day along "small circuit", on second day along "big circuit". •Transportation by air-conditioned car to Tonle Sap Lake on day 3. •Experienced English speaking, licensed local tourguide for full day (eight hours) on first day and second day (eight hours), according to tour program. •Walking tour inside Angkor Thom (about one hour). •Walking tour through "jungle temples" Banteay Kdei and Ta Prohm (about two hours). •Boat trip on Tonle Sap Lake on day 3 (about two hours). •Accommodation for two nights in Ta Som Guesthouse, in air conditioned room with private ensuite bathroom with cold/hot water, minibar, Sat TV. •Transfer to airport / bus- / boat station. •Personal expenses and others not stated above. •The entrance fee for Angkor Archaeological Park (ticket). The South Gate is the best-preserved of the five gateways into Angkor Thom Its approach is via an impressive causeway flanked by 154 stone statues, gods on the left side and demons on the right each carrying a giant serpent. Bayon is the city’s most unique temple shaped like a pyramid, its two most awe-inspiring features are the several huge calm, smiling faces that adorn its towers, and the fascinating bas-reliefs on its many galleries. Built by King Jayavarman VII this structure is over 300 m long. It has three main platforms and two smaller ones. The terrace was primarily used for royal reviews of military and other parades. The entire terrace is elaborately decorated with almost life-size images of sandstone elephants in a procession and accompanied by mahouts. 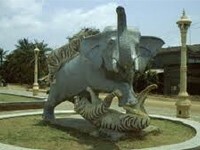 There are many images of tigers, lions, serpents, sacred geese, and Garuda, the eagle mount of Vishnu. Standing on top of this structure is a headless statue, known as the Leper King. Once believed to be an image of King Jayavarman VII who, according to legend, had the disease, it is in fact a representation of Yama, the Hindu God of the Underworld. This statue is, however, a replica, as the original was taken for safekeeping to Phnom Penh's National Museum. A jungle temple which was built by king Jayavarman VII. 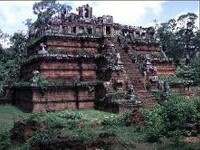 This temple was invaded by Jungle about 500 years old. The Hollywood Movie star 'Angelina Jolie' took her movie here Tomb Raider here. Return to your guesthouse / hotel, finish a half day tour. Accommodation is not included, as this is only a day tour. 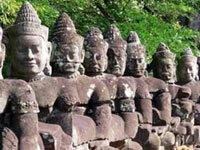 • The entrance fee for Angkor Archaeological Park (ticket $37/person). After a breathtaking day in the temples, relax and enjoy a traditional Khmer massage. Refresh and vitalize your body and win new energy for the next days in Angkor! Enjoy your traditional Khmer massage in your room in Ta Som Guesthouse. Drive by "pajero" (4x4 landrover) 160 km northeastwards via the city of Sisophon to the huge Banteay Chhmar temple complex. Enjoy the journey through the rich farmlands and the scenery of rice fields, water buffalo and authentical Khmer village life. Study the fantastic bas reliefs with scenes depicting historic battles against the Chams. Return to Siem Reap by your air conditioned "pajero" (4x4 landrover). Accomodation is not included, as this is only a daytour. • Transportation in "pajero" (4x4 landcruiser), air conditioned. • Experienced English speaking driverguide. • Information and documentation booklet for visit of Banteay Chhmar. Price is in US-Dollar per person. ... in the birdwathers' paradise! Your tour to Siem Reap / Angkor would be incomplete without the visit of the greatest fresh water reservoir with the highest biodiversity in the world! 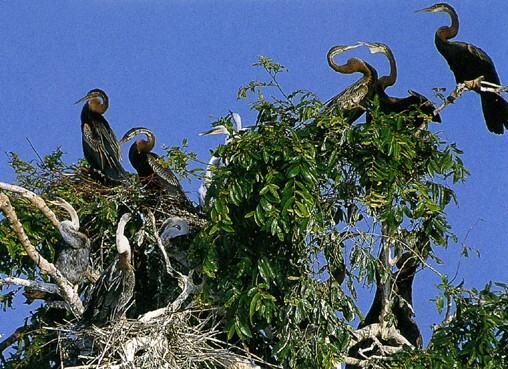 Enjoy a environmental discovery with small boats to thousands of birds in the flooded forests of the Tonle Sap Lake. We visit the Osmose research centre, learn about there important activities to preserve this unique natural heritage. The absolute highlight of this tour is the drive in small two-persons boats. Every guests has his own small boat and is driven by experienced guides who know exactly the best places to see also the endangered species including painted stork, the spot-billed pelican, the grey-headed fish eagle and the black-headed ibis. 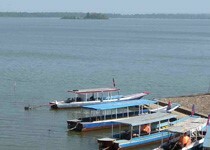 You'll also learn about fishing techniques, environmental protection and making handicrafts from water hyacinth. You shouldn't miss this unique experience! Lunch will be served as lunch boxes (from our Ta Som Guesthouse) that you enjoy on a picturesque place. Return to Siem Reap by boat in the early evening. If time allows, climb up the Phnom Krom to see the beautiful sunset above the Tonle Sap Lake and the surrounding cultural landscape. You'll also learn about fishing techniques, environmental protection and making handicrafts from water hyacinth.You shouldn't miss this unique experience! Lunch will be served as lunch boxes (from our Ta Som Guesthouse) that you enjoy on a picturesque place. • Transportation by air-conditioned car from Ta Som Guesthouse to Tonle Sap Lake (Chong Kneas "harbour"). 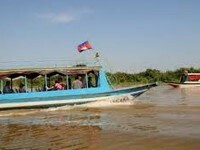 • Boat drive from Chong Kneas to Preak Toal (between one and two hours, depending on water level). • Visit of Osmose research center. • Entrance fee for bird sanctuary . • Excursion in small boats for birdwatching. • Lunch box, mineral water and soft drinks. • Boat drive from Preak Toal to Chong Kneas. • Visit of Phnom Krom for sunset. • Transportation by air-conditioned car back to Ta Som Guesthouse. • Price is in US-Dollar per person. • Price exludes personal expenses and others not stated above. Destination: Siem Reap - Angkor Temples - Banteay Srei - Kampong Phhluk - Phnom Penh - Sihanoukville. Siem Reap / Angkor - Phnom Penh - Sihanoukville. 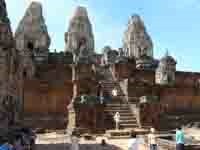 All major Angkor Temples, including Banteay Srei. Boat trip to Kampong Phhluk stilt village & flooded forest.Overland trip to the capital Phnom Penh.City tour Phnom Penh with all highlights.Beach bungalow resort with fantastic sea views. Pick up and check in Ta Som Guesthouse with welcome drink and cold towel. In your room, we provide a tropical fruit basket. By Remork (Khmer motorbiketaxi), drive with your experienced English speaking, licensed local tourguide to the nearby Angkor Archaeological Park, UNESCO heritage site since 1992. 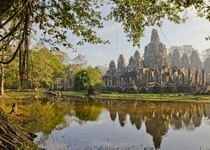 Visit of Angkor Thom, South Gate, Bayon, Baphuon and Phimeanakas Temples. Terrace of the Elephants and Terrace of the Lepra King. Optional: Start your visit by riding a balloon with a great roundview (staying on the same place, around 15 minutes).Sunset from Phnom Bakheng (very busy but famous for sunset) or Preh Rup, a lovely and quiet place. 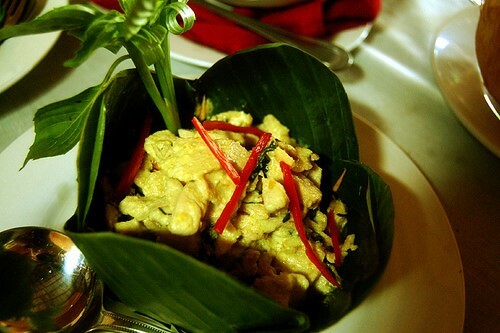 Optional dinner in our Ta Som Garden Restaurant, try the famous traditional Amok Fish, delicious and not spicy! 3 overnights in Ta Som Guesthouse in air conditioned rooms. Day 2: Sunrise in Angkor Wat - Srah Srang - Walking tour through jungle temples - Preah Khan - Neak Pean - Eastern Mebon - Banteay Srei. You shouldn't miss the fantastic sunrise in Angkor Wat - a unique experience! Breakfast (as breakfast picnik box) on the picturesque Srah Srang Water Basin. Enjoy the atmosphere of this quiet place, the former royal bath. The EFEO (Ecole Francaise d'Extrême-Orient) has decided to keep this temple largely overgrown by the jungle. 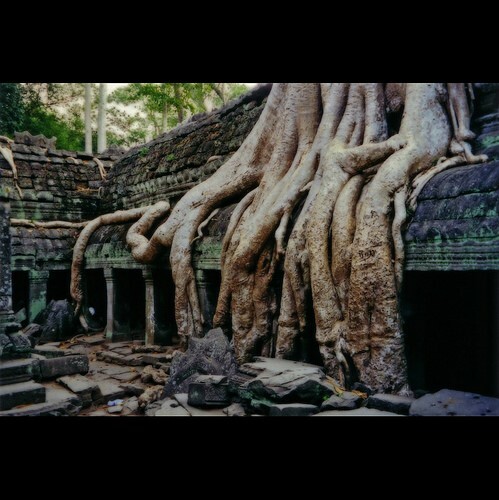 Enjoy the trees growing out from the temple ruins and feel like the first explorers and "rediscoverers" of Angkor, like Henri Mouhot or Lunet de Lajonquière. In the afternoon, we explore Preah Khan Temple with huge trees overgrowing the ruins. The temple complex has been ideally restored by the World Monument Fund. Learn about the enormous looting problem in Angkor and the important saveguarding and preservation activities of the WMF. Go on seeing the most important spots on the "grand circuit", like Neak Pean (holy bath) and the Eastern Mebon with Elephant statues. As Ta Som Temple gave the name to our Guesthouse and Tour Services, the visit of this marvellous small temple is also included in this tour! Ta Som means "the ancestor"; King Jayavarman VII dedicated this temple to his father. Enjoy the famous eastern gopuram of Ta Som, which is depicted on our logo. Take your picture! 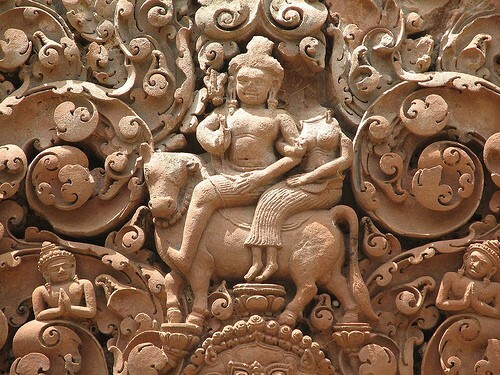 In the late afternoon, you visit word famous Banteay Srei Temple, with its amazing stone carvings of highest quality. This beautiful temple really deserves the nickname "diamond" of Angkor. Transfer back to Ta Som Guesthouse. After your second day in the temples you are certainly tired and will enjoy your included traditional Khmer massage in your room. In Ta Som Garden Restaurant, you should try the traditional beef Lok Lak, together with a refreshing and vitalizing pineapple juice (optional). After breakfast, visit the so called Roluos Group, the place where "Angkor was born" with Bakong Temple, Preah Koh Temple and Lolei Temple. We see the colourful morning market in Roluos with indigenously grown vegetables and many fish species. 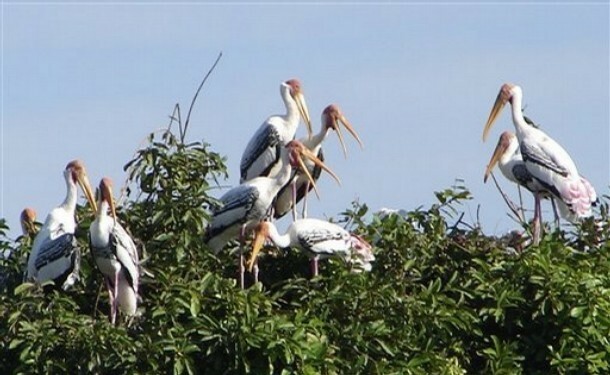 Enjoy your boat trip through the impressive flooded forests of the Great Tonle Sap Lake, habitat of many bird species. 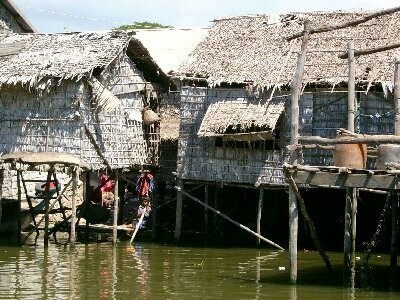 Arrive in Kampong Phhluk, an amazing floating village built on 8 to 10 m high stilts. We have lunch in a family's house (picnik boxes) and learn about the way of living of this still authentic fishing community. This programme is operated according to the water level of the Tonle Sap Lake and is subject to changes. In the dry season, there is no flooded forest, but the houses appear on gigantic stilts, making the visit worthwhile all year round. In the evening, traditional Apsara Dance Show with Buffet Dinner. Take bus from Siem Reap - Phnom Penh At 7 am start your overland trip by Capitol bus through rich farmlands with rice paddies, water buffaloes and sugar palm trees to Cambodia's capital Phnom Penh. 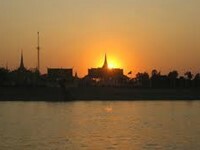 In the evening, sunset cruise in traditional wooden boat on the Mekong River to see "the skyline" of Phnom Penh. Overnight in Capitol Guesthouse or Kim Guesthouse (opened in september 2010). city tour starts with Wat Phnom. See the different shrines of Theravada and Mahayana buddhism and enjoy this quiet place in the heart of the capital. 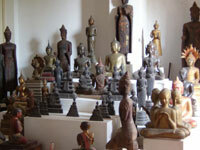 Continue to famous National Museum with the worldwide largest collection of Khmer art. You will see lots of masterpieces of Khmer bronzes, bas-reliefs and sculptures, like the famous reclining Vishnu (from Western Baray) and the stone sculptured head of Jayavarman VII, the most powerful of all Angkorian kings. The museum gives an excellent overview of Angkorian art and history and invites you to sum up your visits of Angkor. By traditional cyclo you will be driven from the Royal Palace to the colourful Central Market. This cyclo tour is certainly one of the highlights of your Phnom Penh experience. Explore the traditional Central Market and the modern Suriya Market with lots of all kinds of foodstands (exclusive). Visit the Tuol Sleng Museum for genocide, and learn about this cruel part of Cambodian history. 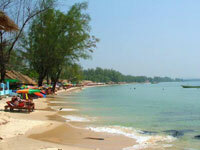 By a/c Capitol Bus, we head southwards to Sihanoukville, Cambodia's most popular seaside resort. Enjoy your overland tour through very scenic cultural landscapes (230 km, about 4 hours). Your are free to choose your departure time. Please select among 7:15am, 8:45am, 11:15am, 12:30pm, 1:30pm and 2:30pm. Decide by yourself if you prefer another individual exploration of Phnom Penh, or if you would like to spend more time at the white sandy beaches of Sihanoukville. It will be hard to leave this fantastic place, that's why there are options for extensions in Sihanoukville (just contact us). 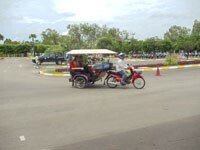 • Transportation by Remork (Khmer motorbike taxi or Tuk Tuk) on day 1 day 2 and day 3. • Transportation by a/c Capitol bus from Siem Reap to Phnom Penh on day 4. • Transportation by a/c Capitol bus from Phnom Penh to Sihanoukville (day 6) and return (day 8, only option B). • All transfers as described in tour itinerary. • Experienced English speaking, licensed local tourguides. • Experienced English speaking drivers. 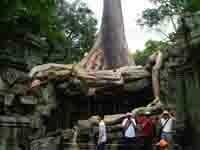 • Walking tour with special itinerary through "jungle temples" Banteay Kdei and Ta Prohm (about two hours). • Boat trip on Tonle Sap Lake to floating village Kampong Phhluk (on day 3). Length of transfer and boat trip depend on the water level. • Phnom Penh City Tour by car or minibus (depending on number of persons), including Wat Phnom and Independent Monument (on day 5). • Entrance fee National Museum Phnom Penh. 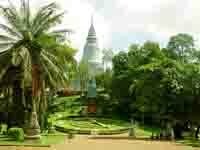 • Entrance fee Royal Palace and Silver Pagoda. • Entrance fee Tuol Sleng Museum. 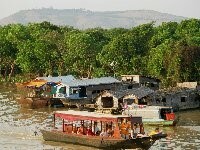 • Mekong river sunset cruise - boat drive on traditional wood boat (about 1 hour). • Accommodation in air conditioned rooms with private ensuite bathroom with cold/hot water, minibar, Sat TV. • 3 nights in Ta Som Guesthouse, Siem Reap. • 2 night Phnom Penh. • Daily breakfast (as breakfast boxes on day 2). • Picnik lunch (as lunch boxes) in a family's house in floating village Kampong Phhluk (on day 3). • Apsara dance show and dinner buffet (on day 3). • Traditional Khmer massage in your room (one hour) in Ta Som guest house. • Meals other than stated above. Please note: As you might wish to add more visits of Angkor Archaeological Park, the entrance fee for Angkor(ticket) is not included. All highlights of Cambodia in one tour: Angkor Temples, Tonle Sap Lake, overland tour to Phnom Penh, discovery of the capital with many special extras. --- Angkor Thom (South Gate, Bayon, Baphuon), Angkor Wat, sunrise in Angkor Wat, Srah Srang, Banteay Kdei, Ta Prohm, Preah Khan, Neak Pean, Ta Som, Eastern Mebon, Pre Rup, Banteay Srei, Banteay Samre. Tonle Sap Lake with boat trip to floating village. Apsara dance show with dinner buffet. Overland trip from Siem Reap to Phnom Penh. Wat Phnom, National Museum, Royal Palace, Silver Pagoda, Tuol Sleng Museum, sunset cruise on Mekong river. In air conditioned car, drive with your our experienced English speaking local tour guide to the nearby Angkor Archaeological Park, UNESCO-World Heritage site since 1992. Study Bayon Temple, with its famous face tours (the "smile" of Angkor) and bass reliefs from the 14th century, depicting the daily life that doesn't seem to have much changed until now. Easy walking tour to Baphuon Temple and Phimenakas Temple. We walk further to the Terrace of Elephants and Terrace of Yama (the so called leper king) and see the fantastic reliefs. 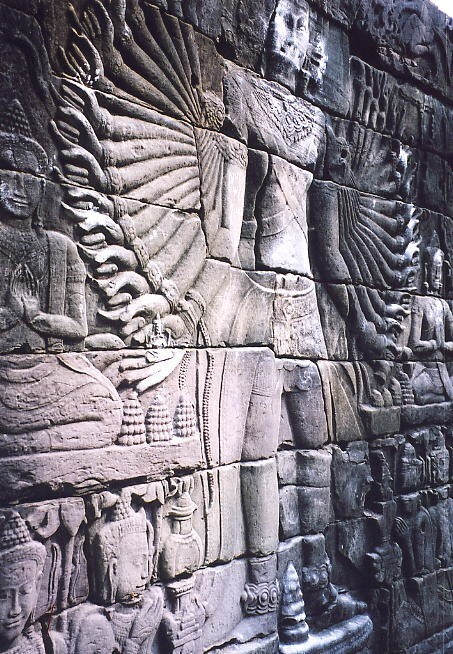 Study the fantastic bas reliefs of Angkor Wat, the largest in the world! 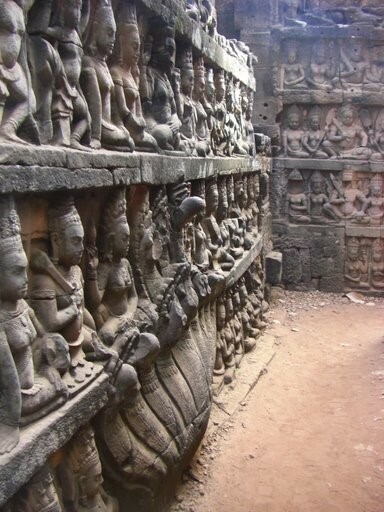 The reliefs depict scenes of Hindu mythology (like the famous churning of the milk sea). Don't miss climbing up to the third level of this holy place, where once only the Angkorian priests and kings have worshiped their gods. Enjoy the great round view and take your time for meditation. 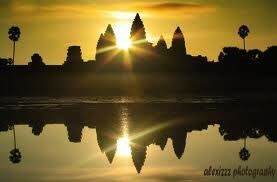 Transfer from Ta Som Guesthouse to Angkor Wat with your driver (without tourguide for sunrise!). After sunrise, you meet your tour guide and have at first breakfast (as breakfast box) on the picturesque Srah Srang Water Basin. Enjoy this quite place, the former royal bath. 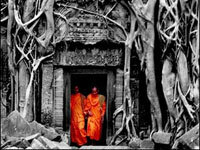 The EFEO (Ecole Francaise d'Extrême-Orient) has decided to keep Ta Prohm Temple overgrown by the jungle, in the estate where the first explorers and "rediscoverers" of Angkor, like Henri Mouhot or Lunet de Lajonquière, saw the whole area. Time for lunch in front of the gigantic Western face gopuram (Western temple entrance) of Ta Prohm in a local restaurant (optional). Our extra special: As Ta Som Temple gave the name to our Guesthouse and Tour Agency, the visit of this marvellous small temple is also included in this tour! Ta Som means "the ancestor", king Jayavarman VII dedicated this temple to his teacher. Enjoy the famous eastern gopuram of Ta Som, which is depicted on our logo. Take your picture! Transfer back to Ta Som Guesthouse, optional dinner. On this second day, you should try the traditional beef loklak, together with a refreshing pineapple juice or tropical fruit shake! After your second day in the temples, you will be certainly tired and you will enjoy the included traditional Khmer massage in your air conditioned room. Relax and revitalize your body for the next days in Angkor! After your breakfast in Ta Som Guesthouse, enjoy your boat trip on the Tonle Sap Lake to see the floating village of Chong Kneas. Visit the traditional fish farm and the crocodile farm and learn about fishing techniques and life on the water. In the afternoon, enjoy your journey through picturesque cultural landscape with rice paddies and sugar palms in the Northern part of the Angkor Archaeological Park. Visit another highlight of Angkor: the famous and precious Banteay Srei Temple. 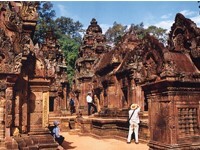 You also visit Banteay Sam Re Temple. In the evening, enjoy a traditional Apsara dance show with a delicious dinner buffet. After breakfast, go by Capitol bus from Siem Reap on the old Angkorian road via Kampong Thom and Skuon ("spider city") to the capital Phnom Penh. Enjoy your journey of 314 km through the rich farmlands and the scenery of rice fields, water buffaloes and authentic Khmer village life. Check-in Capitol Guesthouse and time for leisure. In the evening, enjoy a romantic Mekong river sunset cruise on a traditional wood boat. Relax on the boat and enjoy great views on the “Phnom Penh skyline” (Royal Palace, Silver Pagoda, Mekong riverside promenade) during sunset. In the morning, visit Wat Phnom. See the different shrines of Theravada and Mahayana budhhism and enjoy this quiet place in the heart of the capital. Continue to famous National Museum with the worldwide largest collection of Khmer art. You will see lots of masterpieces of Khmer bronzes, bas-reliefs and sculptures, like the famous reclining Vishnu (from Western Baray) and the stone sculptured head of Jayavarman VII, the most powerful of all Angkorian kings. The Museum gives an excellent overview of Angkorian history and art and invites you to sum up your visits of Angkor. Go on your program with the Royal Palace and its highly decorated throne hall, the flowered royal gardens and of course the famous Silver Pagoda. 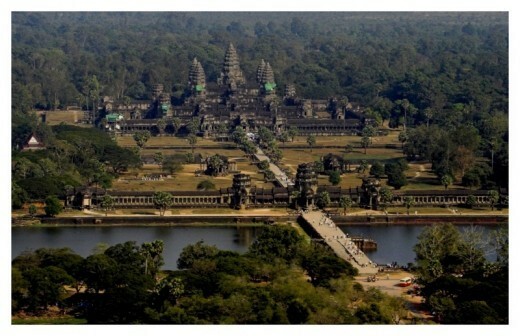 See the model of Angkor Wat giving you a bird eyes’ view of the whole temple area. By traditional “cyclo” you will be driven from the Royal Palace to the colourful Central Market. 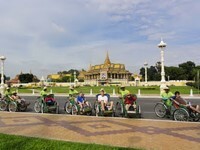 This cyclo tour is certainly one of the highlights of your Phnom Penh program. Explore the market area and have lunch in Suriya Market with lots of all kinds of foodstands (exclusive). 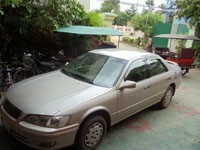 After check-out, transfer to airport / boat - / bus station in Phnom Penh. Have a nice trip to your next destination! Accomodation in air conditioned rooms with private ensuite bathroom with cold/ hot water, minibar, Sat TV. • Pick up from Siem Reap international airport (Ex: flight No AK1482,arrival time:7:50 ) and transfer to Ta Som Guesthouse. • Transportation by air conditioned car or minibus (depending on number of persons). • Transportation by air conditioned Capitol bus on day 4 from Siem Reap to Phnom Penh. • Boat trip on Tonle Sap Lake to floating village (on day 3, about two hours). 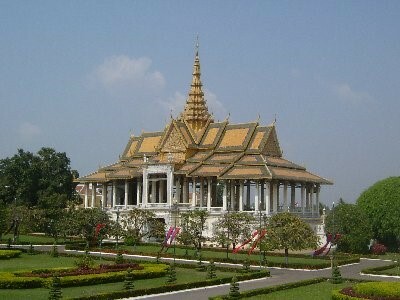 • Phnom Penh City Tour by car or minibus (depending on number of persons), including Wat Phnom and Independent Monument. 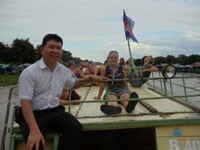 • Mekong river sunset cruise - boat drive on traditional wood boat (about 1 hour without tour guide). • Accomodation for five nights in air conditioned room with private ensuite bathroom with cold/hot water, minibar, Sat TV. • 3 breakfasts in Ta Som Guesthouse (on day 2,3,4). • Traditional Khmer massage in your room (one hour). • Transfer to airport / bus- / boat station in Phnom Penh. • The entrance fee for Angkor Archaelogical Park (ticket). Please note: As you might wish to add more visits of Angkor Archaeological Park, prior or even after this package, the entrance fee for Angkor (ticket) is not included. We also arrange this tour for one person. Prices on request. This is the perfect extension of your Angkor experience. Come with us to the countryside, where life seems to have stood still since Angkorian times. Transportation by REMORK (Tuk Tuk)/air-condition car/mini bus depend on the people and traditional ox-cart. In the morning, start by Remork (Tuk Tuk) with your experienced English speaking guide to the largest water basin of Angkorian history: the Western Baray, 8 km large and 2 km wide. The knowledge and the Scientifics’ discussion about the “hydraulic thesis” (Bernard-Philippe Groslier) is fundamental for understanding the Angkorian countryside. Enjoy your boat trip on the baray to see the Western Mebon (island). On your walking tour through typical villages, you see sugar palm trees, water buffaloes, traditional wooden houses - this is really a traditional village where western influences and acculturation have not (yet) arrived. We go further to rural areas where most tourists will not go and can only continue by ox cart. Enjoy this interesting drive in ox carts through the rice fields. We stop on different places to taste the fresh coconuts and other sweet tropical fruits (like Jakfruit, Mango, Langsat, Dragonfruit) depending on the season. 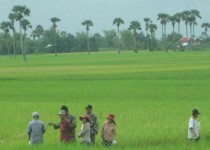 Learn interesting backgrounds about rice cultivation techniques from the farmers. They also show you the different ways they use the sugar palms. We have lunch in a traditional stilt house. See the typical way people live in their villages. This life doesn’t seem to have much changed since Angkorian times (as it is depicted on the famous base-reliefs of Bayon temple). Transfer back to Siem Reap. End of services. • Transportation by Remork (Tuk-Tuk)/air-condition car/mini bus depend on the number of people. • Boat drive on Western Baray to Western Mebon (island). • Transportation by traditional ox-cart at the country side about 3ominutes. • English-speaking experienced tour guide. • Taste of fresh coconut and tropical fruits depending on season. • Lunchbox for picnic in stilt house on picturesque place. Visit Banteay Srey – Pre Rup - East Mebon - Ta Som - Neak Pean & Preah Khan temple. Visit Banteay Srey temple:enjoy an excursion in the Northern part of the Angkor Archaeological Park.On your way, you pass through picturesque landscapes with rice fields and sugar palms to another highlight of Angkor: the famous and precious Banteay Srey Temple. Banteay Srey means "the citadel of the women" and is re known because of its incredible sandstone carvings looking like wood. It really deserves the name "diamond of Angkor". Visit Pre Rup temple: Pre Rup is a temple at Angkor, Cambodia, built as the state temple of Khmer king Rajendravarman and dedicated in 961 or early 962. It is a temple mountain of combined brick, laterite and sandstone construction. The temple’s name is a comparatively modern one meaning "turn the body". This reflects the common belief among Cambodians that funerals were conducted at the temple, with the ashes of the body being ritually rotated in different directions as the service progressed. The East Mebon is 500metre (1,640feet) north of Pre Rup. A enter and leave the temple from the east entrance. It was built in the second half of the tenth century (952) by king Rajendravarman II, dedicated to Siva (Hindu), an ancestor temple in memory of the parents of the king with following the Pre Rup style art. Ta Som Temple,the Khmer temple of Ta Som, located at the eastern end of the Northern Baray at Angkor, was built at the end of the 12th century during the reign of the powerful Buddhist King Jayavarman VII. Little is known of the history and purpose of Ta Som. It was likely dedicated to Jayavarman VII’s father, although some have speculated that it may have been dedicated to one of his teachers. Prasat Neak Pean is located in the east of Prah Khan, 300 meters (984 feet) from the road.A enter and leave from the north entrance. It was built in second half of the 12th century by king Jayavarman VII, dedicated to Buddhist, with following to Prasat Bayon art style. Visit Preah Khan Temple: Preah Khan built in the 12th century for King Jayavarman VII. 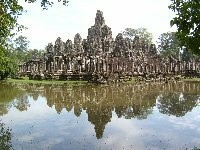 It is located northeast of Angkor Thom and just west of the Jayatataka baray, with which it was associated. It was the centre of a substantial organization, with almost100,000 officials and servants. The temple is flat in design, with a basic plan of successive rectangular galleries around Buddhist sanctuary complicated by Hindu satellite temples and numerous later additions. Like the nearby Ta Prohm,Preah Khan has been left largely unrestored, with numerous trees and other vegetation growing among the ruins. Accommodation is not included, as this is a day tour. Transfer with our experienced English speaking local tour guide to the nearby Angkor Archaeological Park, UNESCO-World Heritage site since 1992. Entering Angkor Thom, this once largest city of the world form the South Gate, you admire the street of 108 gods and devils. Study Bayon Temple with its famous face tours (the "smile" of Angkor) and base reliefs from the 12th century, depicting the daily life that doesn't seem to have much changed until now. Visit of Ta Prohm,the EFEO (Ecole Francaise d'Extrême-Orient) has decided to keep this temple overgrown by the jungle. 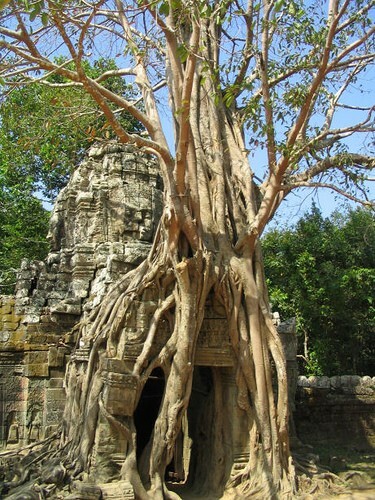 Enjoy the trees growing out from the temple ruins and feel like the first explorers and "rediscoverers" of Angkor, like Henri Mouhot or Lunet de Lajonquière. 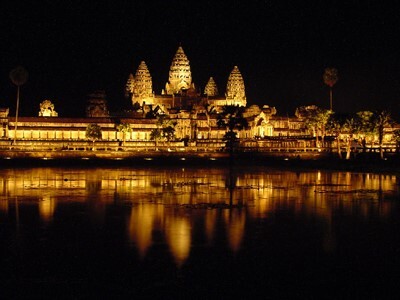 Visit Angkor Wat temple in the afternoon, with the best light, intensive visit of world famous Angkor Wat temple. Optional: You can start your visit by riding a balloon (staying on the same place, around 15 minutes!). Great round view. Take your best fotos! Visit Sunset from Phnom Bakheng temple (very busy but famous for sunset). Transfer back to your guest house/hotel. 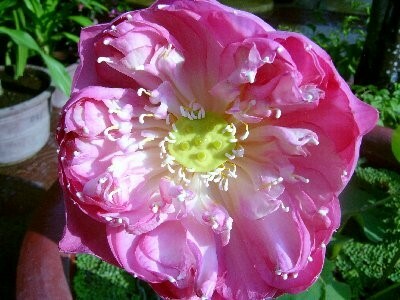 • Experienced English speaking, licensed local tour guides. In the early morning, start from Ta Som Guest House & Tours Services with your experienced English speaking guide and air conditioned car/minibus on Road Number 6 to Damdaek village with its nice market area. 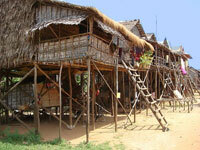 On your way to Koh Ker, see picturesque Khmer villages with traditional stilt houses. After 1 ½ hours, arrive in Koh Ker. Visit at first the 35 metres high temple mountain, called Prasat Thom. Breathtaking views from the summit. Drive around by your car/minibus to remote temple areas with gopurams and nice carvings and lintels. See the holy lingams in the cellas. Visit the stone carries, where the sandstone, used for building most Angkor temples, was broken. You will have lunch (optional) on a lovely place on the Baray (water basin) in Beng Mealea. Feel like the first explorers when you search your way over broken ruins and temple walls. The large temple area is still overgrown by the tropical dry forest. In the late afternoon, you drive back with your air conditioned car/minibus to Siem Reap. Overland trip from Phnom Penh (Capitol city of Cambodia) to Battambang province (enjoy Bamboo train & boat trip to Siem Reap province). Visit Angkor temples: Angkor Thom (South gate of Angkor Thom - Bayon - Bapuon - Phimeanakas - Elephants & Leper king Terrace) - Ta Phrom - Banteay Kdei - Angkor Wat - Bakheng temple - grand circuit: (Pheah Khan - Neak Pean - Ta Som - Eastern Mebon - Pre Rep) - Banteay Srei - Khbal Spean (see waterfall) - Banteay Srei - Banteay Sam Re - Kampong Phluk floating village on Tonle Sap lake. Tour finish in Siem Reap. • Pick up from hotel in Phnom Penh at 7am to Battambang province by air condition Capitol bus around 6 hours. • Pick up from bus station in Battambang to hotel. • Afternoon you will be picked up from hotel and transfer to Bamboo train (about 1hour without tour guide). Overnight in Battambang. Date: Mon, 10 Sep 2012 18:33:57 +0200(E-mail: nero_nerino@yahoo.it)The bamboo train nice but Now probably Too turistic, ferry between Battambang and Siem Reap Very nice and interesting.. Worth the visit to battambang. • Pick up from hotel at 6:45am, transfer to the ferry doc, the boat will leave at 7am to Siem Reap/ Angkor. 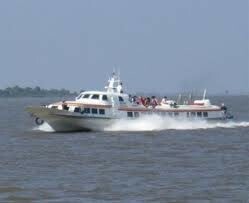 • Enjoy boat trip on Tonle Sap Lake about 7 hours. • Pick up from the ferry doc to hotel (12km from Siem Reap center town ). • After arrival in Siem Reap and check in hotel. Free time. Visit of Angkor Thom, South Gate, Bayon, Baphuon and Phimenakas Temples. Terrace of the Elephants and Terrace of the Leper King. Optional lunch in Angkor Thom. 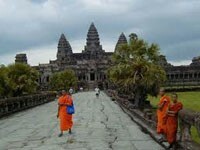 In the afternoon, intensive visit of world famous Angkor Wat temple. Study the fantastic bas reliefs and climb up to the temple's third level. Optional: Start your visit by riding a balloon with a great roundview (staying on the same place, around 15 minutes!). Sunset from Phnom Bakheng (very busy but famous for sunset) or Preh Rup, a lovely and quiet place. 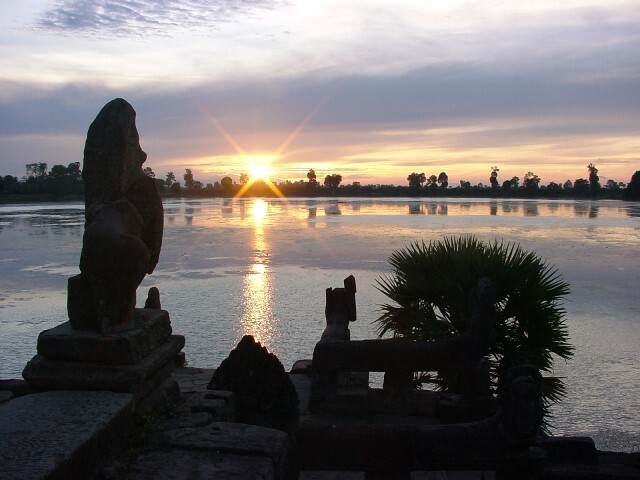 After an unforgettable "must see" sunrise in Angkor Wat, you meet your tour guide and have at first breakfast (as breakfast box) on the picturesque Srah Srang Water Basin. Enjoy this quiet place, the former royal bath. 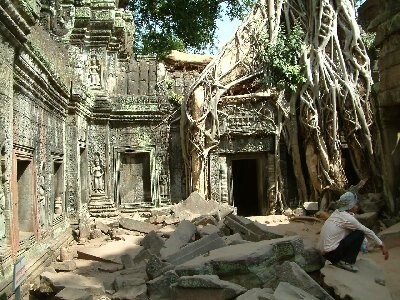 Visit Banteay Kdei and Ta Prohm, the so called "jungle temples". 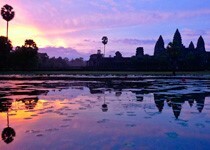 Enjoy to "feel" and to "smell" Angkor! Optional lunch near Ta Prohm Temple. 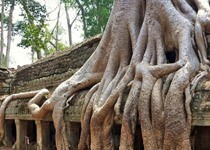 In the afternoon, explore Preah Khan temple (with huge trees overgrowing the ruins). Go on seeing the most important temples on the "grand circuit", like Neak Pean (holy bath) and the Eastern Mebon (with Elephant statues). Ta Som Temple was built by Jayavarman VII on Late 12th century. The visit of this marvellous small temple is also included in this tour! Ta Som means "the ancestor", king Jayavarman VII dedicated this temple to his father. Enjoy the famous eastern gopuram of Ta Som. Don't miss to take your picture. 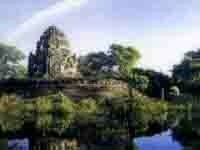 Go on to visit Pre Rup temple. Banteay Srei - Kobal Spean / River of Thousand Lingams - Wildlife Centre ACCB - Banteay Samrei After breakfast, enjoy your excursion in the Northern part of the Angkor Archaeological Park. We go on northwards to a holy place, where in Angkorian times, thousands of Lingams (the phallus symbol of the Lord Shiva) have been carved into the riverbed, in order to fertilize the water going down to the Angkorian plain. This place is called Kobal Spean or the River of Thousand Lingams. Easy Walking tour (about one hour) through tropical dry forest and see the different places of carvings in the riverbed. Your experienced English speaking tourguide explains you the meaning of the interesting carvings. Time for lunch in a local restaurant in Kobal Spean (not included). At 1pm, we visit ACCB, the Angkor Centre for Conservation of Biodiversity. It is the first nature conservation and endangered wildlife rescue and breeding centre in Cambodia. Here, we will be guided by an ACCB expert. On your way back to Siem Reap, you also visit Banteay Samre Temple. 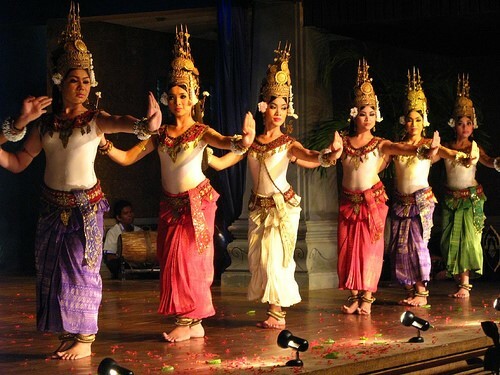 In the evening, enjoy a classical Apsara dance show. Dinner buffet included. Overnight in Ta Som Guesthouse in air conditioned room. 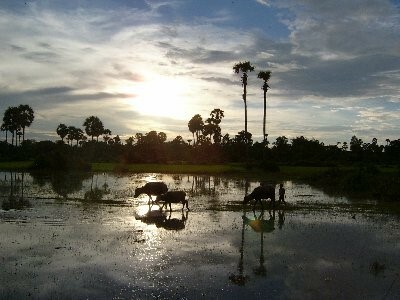 Kompong Phluk is a commune and village in Siem Reap Province in northern-central Cambodia. 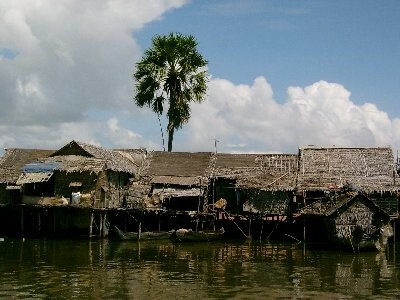 It is a floating village on the Tonle Sap. The village has a school and monastery, where prayers were taking place. Start at 8.30 am. We see the morning market in Roluos with indigenously grown vegetables and many fish species. Enjoy your boat tour through the flooded forests of the Great Tonle Sap Lake, habitat of many bird species and arrive in Kampong Phhluk. 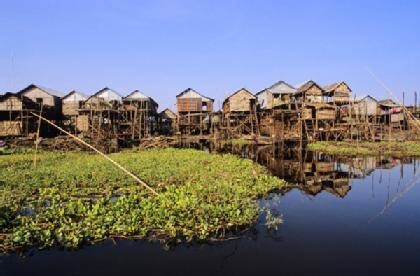 This amazing floating village is built on 8 to 10 m high stilts. We visit an island pagoda, a school and traditional stilt houses. We have lunch in a family's house (picnik boxes with sandwiches and drinks including). After lunch, we see fishfarms and learn about the way of living in this still authentic community. Please note: Depending on the season and the level of the Tonle Sap Lake, this program is subject to changes. From August to January, the water level is high enough to make the boat trip through the flooded forest. • Battambang: 1 night at Holiday hotel (including breakfast). • Sim Reap/Angkor:4nights at Ta Som Guesthouse with single air condition room, hot & cold shower, private bathroom (including breakfast). 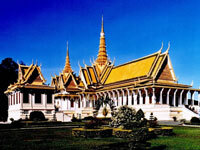 • Pick up from hotels in Phnom Penh at 7:30am and transfer to Capitol tours office. 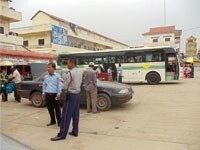 • Transportation by air conditioned Capitol bus on day 1 from Phnom Penh to Battambang province about 6 hours on road 5. 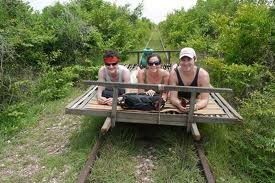 • Take the bamboo train in the evening at 4:30 pm on day 1(about 1 hour without tour guide). • Experienced English speaking license local tour guide on day 3, 4, 5 and day 6. • Take the boat at 7am from Battambang through Tonle Sap Lake to Siem Reap province (on day 2, about 7 hours). • Transport by Remork (Tuk Tuk) to Bamboo train and Angkor temples 1pax up to 2pax. • Transport by air condition car, min bus or bus from 3pax up (depending on number of persons). • On day 1 at Battambang bamboo train in the evening, day 2 (visit sunset at Bakheng temple leave at 4:45pm from the hotel), day 3, day 4, day 5 and day 6 full day visit. • Ticket for bamboo train. • Accommodation for five nights in air conditioned room with private ensuite bathroom with cold/hot water, minibar, Sat TV. • One lunch on day 6 at Kampong Phluk floating village on Tonle Sap lake. • Traditional Khmer massage in your room at Ta Som Guesthouse (one hour). • Transfer to airport / bus station on day 6 at evening. We also organize private tours for your own group by Remork (Tuk Tuk), car, minibus or bus with or without tour guide at reasonable price. Visit Phnom Penh (city tour:Wat Phnom, National Museum, Royal Palace, Silver Pagoda, Tuol Sleng Museum, sunset cruise on Mekong river) - Kampong Cham (Wat Nokor Bachey – Phnom Pros & Phnom Srey) – Kampong Thom (Samboprei Kuk temples) – Kampong Kdei (history bridge) – Roluos Group (Lo Lei, Preah Ko & Bakong temple) – Ankor Wat – Angkor Thom (south gate of Angkor Thom, Bayon, Bapuon, Phimean Akas, elephant & Liper king terrace, Taphrom) – grand tour (Pre Rup, East Mebon, Ta Som, Neak Pean & Preah Khan temple) – Banteay Srey – Banteay Sam Re – Tonle Sap Lak – Koh Ker – Beng Mea Lea Temple. Pick up from your arrival point in Phnom Penh (Bus / Boat station /airport ),transfer and check in Hotel. Transfer with our experienced English speaking local tour guide to visit Wat Phnom. See the different shrines of Theravada and Mahayanabudhhism and enjoy this quiet place in the heart of the capital. 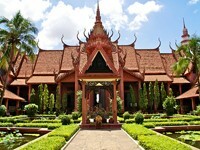 Continue to famous National Museumwith the worldwide largest collection of Khmer art. You will see lots of masterpieces of Khmer bronzes, bas-reliefs and sculptures, like the famous recliningVishnu (from Western Baray) and the stone sculptured headof Jayavarman VII, the most powerful of all Angkorian kings. The Museumgives an excellent overview of Angkorian history and art and invites you to sumup your visits of Angkor. Go on your program with the RoyalPalace and its highly decorated thronehall, the flowered royal gardens and of course the famous SilverPagoda. 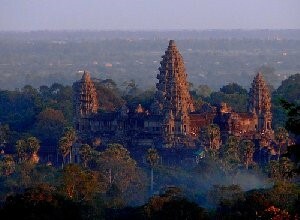 See the model of Angkor Wat giving you a bird eyes’ view of thewhole temple area. TuolSleng Genocide Museum - Photos of people killed by Pol Pot’s murderous Khmer Rouse Regime. 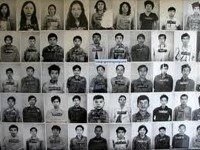 Cambodia- Photos of people killed by Pol Pot’s murderous Khmer Rouse Regime are exhibited in Toul Sleng, the regime’s biggest tortureand death chamber. Up to two millions people are believed to have died from starvation, overwork or execution from 1975-1979. Cambodia has more than 300“killing fields”. By traditional “cyclo” you will be driven from the Royal Palaceto the colourful Central Market. 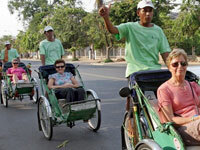 This Cyclo tour is certainly oneof the highlights of your Phnom Penh program. Explore the market areaand have lunch in Suriya Market with lots of all kinds of food stands(exclusive). In the evening, enjoy a romantic Mekong river sunset cruise on atraditional wood boat. Relax on the boat and enjoy great views on the “Phnom Penh skyline” (Royal Palace, Silver Pagoda, Mekong riverside promenade) during sunset. After breakfast transfer to Kampong Cham province around124km, visit Nokor Bachey Temple: The first long building of Nokor Bachey Temple of KampongCham is 421 meters and 371 meters in dimension made of laterite stones.Theheight is of 9 meters and the length is 2.4 meters. Most part of this buildinghas been destroyed over time. Inside this building you will find structures likeSix Lions, Eight Dragons and Two Devils. The second long building is also abeautiful architectural structure that includes two statues of Te Cho Dam Din,two devils each of 1.6-metre in height and two ponds. The most significant long building is the third,where visitors will find a eight-hand statue of Preah Norey located nearthe entrance. A four-hand statue of Preah Norey is located on the left hand sideof the Nokor Bachey Temple, Kampong Cham. Finally comes the fourth longbuilding,which is also made of laterite stone and can be accessed from 12directions. Inthe middle of the building you will find a high peak made ofsandstone with Buddhist statue. The Phnom Srey and Phnom Pros islocated at Kro La Commune, which is at a distance of seven kilometers from theprovincial town of Kampong Cham. The Phnom Srey and Phnom Pros in Kampong Chamis the name of a mountain peak that belongs to a mountain range exceeding 500meters to the left. The northern part of Phnom Srey and Phnom Pros of KampongCham is surrounded by spectacular mountains of Dang Rek, Ba Ley and Chhuk. Kampong Thom is a province located at the central point of the Kingdom of Cambodia. 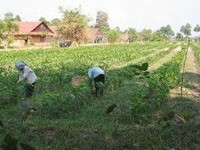 ambor Prei Kuk cluttering sanctuaries were located in Sambor Village, Kampong Cheuteal Commune, Prasat Sambor District, Kampong Thom Provice. King Mahendravarman had reigned form 607 to 616, was a son of a king Sambor Prei Kuk style characterized the real khmer telent. After right received influence and developed her own arts sufficient to the modern development. 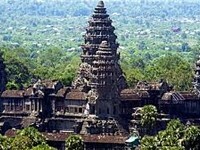 Arts and civilization of Angkor was the great achievement in Southeast Asia. 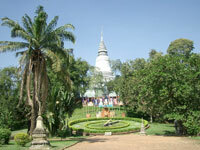 The well-known city was called Isanapura is presently located at Sambor Prei Kuk, Kampong Thom Province. 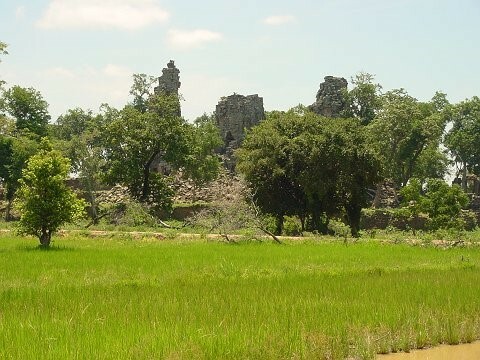 Sambor Prei Kuk is 25km north of Provincial Town of Kampong Thom. By observation, there are 52 small and big sanctuaries are in fairly good condition, the other 52 sanctuaries were fallen down and buried into the ground, and then became small hills. The sanctuaries were built of brick and limestone with the decoration of bas-relief on the scenery walls. The foundation of sanctuary was made of laterite, false door, diamond column and the sculptures were made of sandstone. The Kampong Kdei Bridge is located in Doeumpor Village, Kok Thlok Kraom Commune, Chi Krèng District, Siem Reap Province. 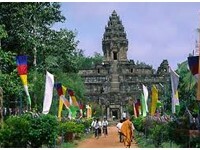 It is 254 km away from the Phnom Penh Capital along the National Road No 6 and 60 km southeast of the Siem Reap Town. 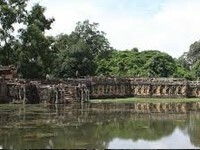 The bridge was erected by King Jayavarman VII in the late 12th century. At that time, it was located in the stretch of the road between the Angkorean City and Phan Rang past Sambo Prei Kuh, Wat Nokor, Ba Phnom and Indra Borei. During his reign, along the road in every 15 km, there was an electric lamp-installed rest-house that enabled travelers to stop for a while or to stay overnight before they continued their trips. 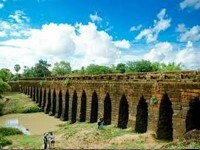 Nowadays, between the Siem Reap Town and the Kampong Thom provincial boundary we see only ten ancient bridges, but the Kampong Kdei Bridge is the longest one that is 80m long and 14m wide and has twenty-one axes. The Kampong Kdei Bridge is now firmly standing, and it is still being used as a main infrastructure for facilitating both travel and heavy loaded truck. 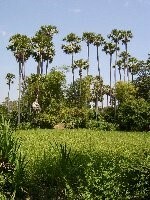 Roluos group is a modern small town and an archeological site about 13 km east of Siem Reap along National Road 6. Once it was the seat of Hariharalaya, first capital of Khmer Empire north of Tonle Sap (as the first capital in the strict sense of the term could have been Indrapura, identifiable with Banteay Prey Nokor).Among "Rolous Group" of temples there are some of the earliest permanent structures built by Khmer. 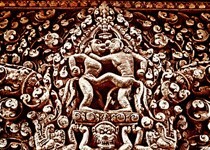 They mark the beginning of classical period of Khmer civilization, dating from the late 9th century. Some were totally built with bricks, others partially with laterite or sandstone (the first large angkorian temple built with sandstone was possibly Ta Keo).At present it is composed by three major temples: Bakong,Lo Lei and Preah Ko. At both Bakong and Lo Lei there are contemporary Theravada Buddhist Monasteries. Preah Ko (The Sacred Bull) was the first temple to bebuilt in the ancient and now defunct city of Hariharalaya (in the area thattoday is called Roluos), some 15 kilometers south-east of the main group oftemples at Angkor, Cambodia. The temple was built under the Khmer KingIndravarman I in 879 to honor members of the king's family, whom it places inrelation with the Hindu deity Shiva. Lolei is the northern most temple of the Roluos group of three late 9thcentury Hindu temples at Angkor, the others members of which are Preah Ko andthe Bakong. Lolei was the last of the three temples to be built as part of thecity of Hariharalaya that once flourished at Roluos, and in 893 the Khmer KingYasovarman I dedicated it to Shiva and to members of the royal family. The name"Lolei" is thought to be a modern corruption of the ancient name"Hariharalaya," which means "the city of Harihara." Once anisland temple, Lolei was located on an island slightly north of centre in thenow dry Indratataka Baray, construction of which had nearly been completedunder Yasovarman's father and predecessor Indravarman I.
Scholars believe thatplacing the temple on an island in the middle of a body of water served toidentify it symbolically with Mount Meru, home of the gods, which in Hindumythology is surrounded by the world oceans. 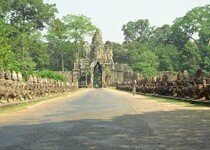 Start from the South Gate of Angkor Thom is one of the five gate ways into the ancient Khmer city of Angkor Thom. 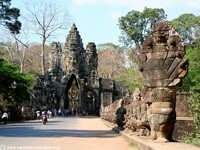 The South Gate is the most visited of the five Angkor Thom gates, as it is the one nearest to Angkor Wat. The South Gate of Angkor Thom is also the best preserved and restored.Compared with the other gates of Angkor Thom, the South Gate is quite complete. As we approach it, we can see a row of statues on each side of the causeway.On the left are the gods while on the right are the demons, or Asuras. 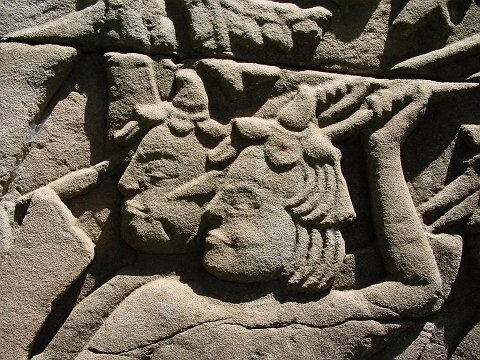 They are supposed to be engaged in a tug-of-war holding on to the seven-headed serpent,or Naga. 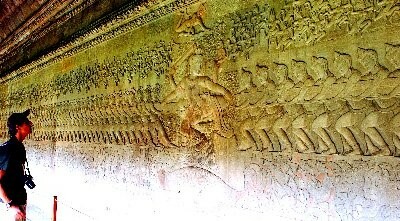 This is a three-dimensional depiction of the Hindu creation myth, churningof the Ocean of Milk, which is also shown in two-dimension on the base-relief of Angkor Wat. The Bayon temple (Prasat Bayon) is a well-known and richly decorated Khmer temple at Angkor in Cambodia.Built in the late 12th century or early 13th century as the official state temple of the Mahayana Buddhist King Jayavarman VII, the Bayon stands at the centre of Jayavarman's capital Angkor Thom. Following Jayavarman's death, it was modified and augmented by later Hindu and Theravada Buddhist kings in accordance with their own religious preferences. The Bayon's most distinctive feature is the multitude of serene and massive stone faces on the many towers which jut out from the upper terrace and cluster around its central peak.The temple is known also for two impressive sets of bas-reliefs, which present anunusual combination of mythological, historical and mundane scenes. The current main conservatory body, the Japanese Government team for the Safe guarding of Angkor (the JSA) has described the temple as "the most striking expressionof the baroque style" of Khmer architecture, as contrasted with the classical style of Angkor Wat. The Baphuon is located in Angkor Thom, northwest of the Bayon temple. Built in the mid-11th century, it is a three-tiered temple mountain built as the state temple of Udayadityavarman II dedicated to the Hindu God Shiva. 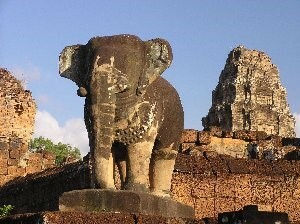 It is the archetype of the Baphuon style. The temple adjoins the southern enclosure of the royal palace and measures 120 metres east-west by 100 metres north-south at its base and stands 34 meters tall without its tower, which would have made it roughly 50 meters tall. Its appearance apparently impressed Emperor Chengzong of Yuan China's late 13th century envoy Chou Ta-Kuan during his visit from 1296 to 1297, who said it was 'the Tower of Bronze...a truly astonishing spectacle, with more than ten chambers at its base.' In the late 15th century, the Baphuon was converted to a Buddhist temple. A 9 meter tall by 70 meter long statue of a reclining Buddha was built on the west side's second level, which probably required the demolition of the 8 meter tower above, thus explaining its current absence. The temple was built on land filled with sand, and due to its immense size the site was unstable throughout its history. Large portions had probably already collapsed by the time the Buddha was added. Phimeanakas isa Hindu temple in the Kheang style, built at the end of the 10th century,during the reign of Rajendravarman (from 941-968), then rebuilt by SuryavarmanII in the shape of a three tier pyramid as a Hindu temple. On top of thepyramid there was a tower. According to legend, the king spent the first watch of everynight with a woman thought to represent a Naga in the tower, during that time,not even the queen was permitted to intrude. Only in the second watch the kingreturned to his palace with the queen. If the Naga who was the supreme landowner of Khmer land did not show up for a night, the king's day would benumbered, if the king did not show up, calamity would strike his land. 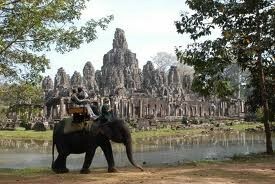 The Terrace of the Elephants is part of the walledcity of Angkor Thom. 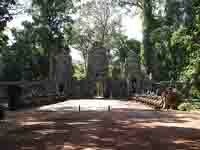 The terrace was used by Angkor's king Jayavarman VII as aplatform from which to view his victorious returning army. 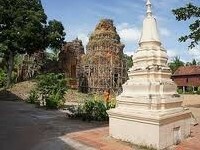 It was attached tothe palace of Phimeanakas, of which only a few ruins remain. Most of theoriginal structure was made of organic material and has long since disappeared. Most of what remains are the foundation platforms of the complex. The terraceis named for the carvings of elephants on its eastern face. The 350m-long Terrace of Elephants was used as a giantreviewing stand for public ceremonies and served as a base for the king's grandaudience hall. It has five outworks extending towards the Central Square-threein the centre and one at each end. 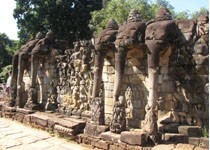 The middle section of the retaining wall isdecorated with life size Garuda and Lions; owards either end are the two partsof the famous parade of elephants complete with their Khmer mahouts. The Terrace of the Leper King (or LeperKing Terrace) is located in the northwest corner of the Royal Square of AngkorThom. It was built in the Bayon style under Jayavarman VII, though its modernname derives from a 15th century sculpture discovered at the site. The statuedepicts the Hindu god Yama, the god of Death. He was called the Leper Kingbecause discoloration and moss growing on the original statue was reminiscentof a person with leprosy, and also because it fit in with a Cambodian legend ofan Angkorian king who had leprosy. The name that the Cambodians know him by,however, is Dharmaraja, as this is what was etched at the bottom of theoriginal statue. The U-shaped structure is thought by some to have been used asa royal cremation site. 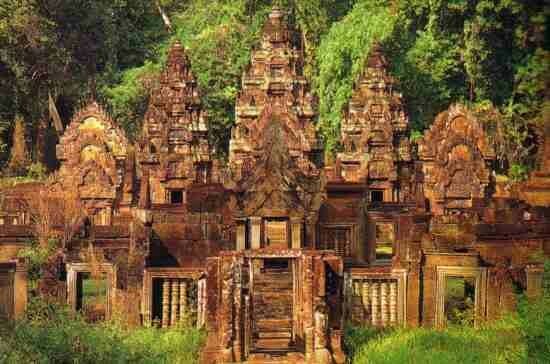 Banteay Srey is a 10th century temple dedicated to the Hindu godShiva. It lies near the hill of Phnom Dei, 25 km (16 mi) north-eastof the main group of temples that once belonged to the medieval capitals ofYasodharapura and Angkor Thom. Banteay Srei is built largely of red sandstone, amedium that lends itself to the elaborate decorative wall carvings which arestill observable today. 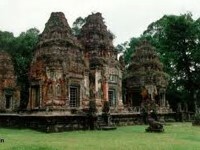 The buildings themselves are miniature in scale,unusually so when measured by the standards of Angkorian construction. Thesefactors have made the temple extremely popular with tourists, and have led toits being widely praised as a "precious gem", or the "jewel ofKhmer art. Banteay Sam Re is a temple which located east of the East Baray. Built under Suryavarman II and Yasovarman II in the early 12th century, it is a Hindu temple in the Angkor Wat style. 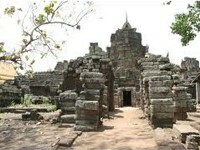 The temple uses the same materials as the Banteay Srey. 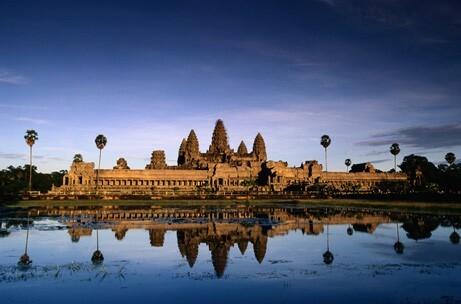 Visit Angkor Wat is one of the most important archaeological sites in South-East Asia. Stretching over some 400 km2, including forested area, Angkor Archaeological Park contains the magnificent remains of the different capitals of the Khmer Empire, from the 9th to the 15th century. 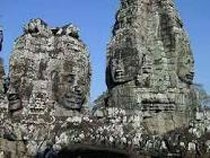 They include the famous Temple of Angkor Wat and, at Angkor Thom, the Bayon Temple with its countless sculptural decorations. UNESCO has set up a wide-ranging programme to safeguard this symbolic site and its surroundings. 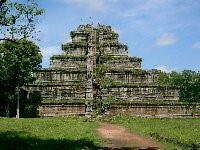 Pre Rup temple was built as the state temple of Khmer king Rajendravarman and dedicated in 961 or early 962. It is a temple mountain of combined brick,laterite and sandstone construction.The temple’s name is a comparatively modern one meaning "turn the body". This reflects the common belief among Cambodians that funerals were conducted at the temple, with the ashes of the body being ritually rotated in different directions as the service progressed. Ta Som is a small temple, built at the end of the 12th century for King JayavarmanVII. It is located north east of Angkor Thom and just east of Neak Pean.The King dedicated the temple to his father Dharamindravarman II (Paramanishkalapada) who was King of the Khmer Empire from 1150 to 1160. The temple consists of asingle shrine located on one level and surrounded by enclosure laterite walls.Like the nearby Preah Khan and Ta Prohm the temple was left largely unrestored,with numerous trees and other vegetation growing among the ruins. In 1998, the Wotld Monuments Fund (WMF) added the temple to their restoration program and began work to stabilise the structure to make it safer for visitors. Neak Pean ("The entwined serpents") is anartificial island with a Buddhist temple on a circular island in Preah KhanBaray built during the reign of King Jayavarman VII. 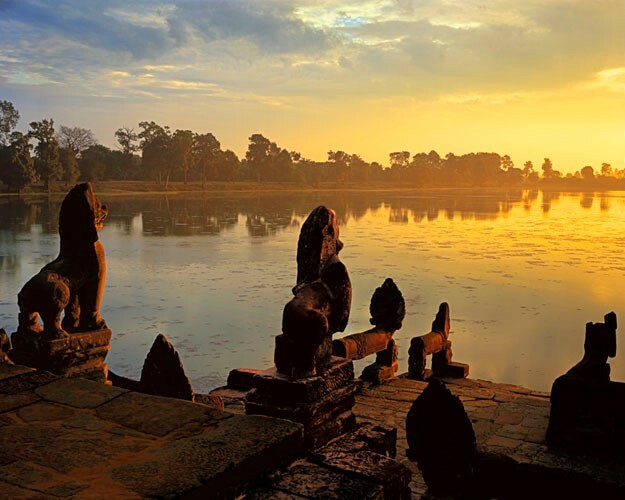 Some historians believe that Neak Pean represents Anavatapta,a mythical lake in the Himalayas whose waters are thought to cure all illness.NeakPean was originally designed for medical purposes, as it is one of the manyhospitals that Jayavarman VII built. It is based on the ancient Hindu belief ofbalance. Four connected pools represent Water, Earth, Fire and Wind. Theancients believed that going into these pools would balance the elements in thebather, thus curing disease. In the middle of the four healing ponds is thecentral water source. There is a statue of Balaha (Bodhisattva Guanvintransformed into a horse), as a symbol of drowning prevention. Preah Khan is built in the 12th century for King Jayavarman VII. 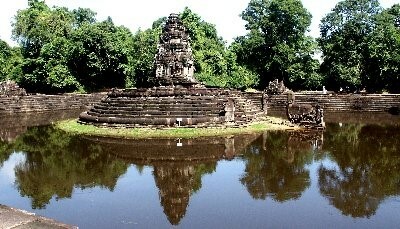 It is located north east of Angkor Thom and just west of the Jayatataka baray, with which it was associated. It was the centre of asubstantial organisation, with almost 100,000 officials and servants. The temple is flat in design, with a basic plan of successive rectangular galleries around a Buddhist sanctuary complicated by Hindu satellite temples and numerous later additions. Like the nearby Ta Prohm, Preah Khan has been left largely unrestored, with numerous trees and other vegetation growing among the ruins. Ta Prohm was built in the Bayon style largely in the late 12th and early 13th centuries and originally called Rajavihara. Located approximately one kilometre east of Angkor Thom and on the southern edge of the East Baray, it was founded by the Khmer King Jayavarman VII as a Mahayana Buddhist monastery and university. Unlike most Angkorian temples, Ta Prohm has been left in much the same condition in which it was found: the photogenic and atmospheric combination of trees growing out of the ruins and the jungle surroundings have made it one of Angkor's most popular temples with visitors.